TOKYO – My holiday trip to Japan’s sprawling capital was awe-inspiring, intimidating, and fascinating. Coming from a monolingual Westerner who had never left North America, Tokyo’s population of 35 million—the most of any metropolitan area in the world—and spaghetti-like labyrinth of nameless streets was, to say the least, daunting. It almost looks peaceful and serene, doesn’t it? As you can imagine, Tokyo is anything but. So once I got above street level and had an opportunity to enjoy the view, I found I could sit for hours and be completely entertained by the metropolis’ sheer size. 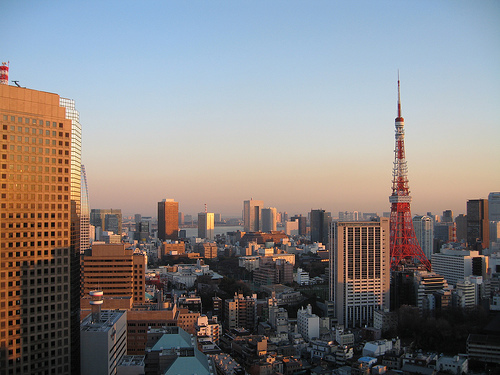 From the neighborhood of Roppongi, not far from the Tokyo Tower (pictured), skyscrapers pack the landscape as far as the eye can see. The inhabitants of this futuristic yet traditional society are, relatively speaking, quite smoker friendly. The lamentable anti-smoking frenzy hasn’t yet reached Japan’s densely populated shores. Most bars and many restaurants welcome smokers, Tokyo’s businessmen are often seen outside puffing away on cigarettes (half of adult Japanese males smoke them), and tobacco is readily available in many vending machines. Case in point: In a scene that could have been taken from Lost in Translation, I had no trouble lighting up a cigar in one high-end restaurant/bar with a spectacular view. No one else was packing a stogie—I didn’t see many other cigars outside the stash I brought from the U.S.—but my fellow patrons didn’t even bat and eyelash. Heck, I would have fired up a Perdomo on the bullet train I took to Hiroshima if there was a seat to be had in the smoking car. Too bad. I think it would have been spectacular to smoke premium tobacco at 185mph while Mount Fuji flew by. All this isn’t to say, however, that smoking is completely tolerated on the island. There are scores of “No Smoking” and smoking etiquette signs, most of them comical. And, demonstrating the choice that prevails in the absence of heavy-handed government edicts, it isn’t hard to find self-regulated smoke-free restaurants and bars. What are hard to find are tobacco shops. Well, let’s face it; everything is hard to find in Tokyo. But I didn’t stumble across a single establishment that sold cigars in all of my lengthy excursions in Japan. I would imagine, though, that Cubans are readily available for a hefty price. (Everything is expensive in Japan, and the current dollar-yen exchange rate doesn’t do American tourists any favors.) So, if you’re planning a trip of your own, let me suggest you bring along enough cigars to last the trip. Then you’ll be all set to take in one of the most interesting and unique cultures in all of the developed world. You did not look too hard, this link shows the shops that sell cigars in Japan. Also, Japan has the reverse anti-smoking laws… you can not smoke in public places. The place where you stayed is in Minato-ku which past a law that went into effect in July that makes smoking illegal on streets or any other public area. On the other hand, you are right that you can smoke in almost any restaurants. One other point, smoking on the the bullet trains is no longer allowed, in fact you can not smoke on any of the trains anymore, all the smoking cars are gone. No, I didn't look too hard. Given the prices, my stash from the U.S., and the fact that I was travelling with people who aren't really into cigars, I was content with everything else we were up to. I understand there is some sort of public places smoking law. If that's the case, though, it isn't really enforced. I saw lots of smoking on the streets, in parks, etc. Finally, I don't know where you got your bullet train info from, but the "shinkansen" I took from Toyko to Hiroshima definitely had a smoking car. No doubt about it. Singapore is another smoker friendly place – great cigars were available in many of the higher-end hotel bars. Smoking was tolerated in bars but not in public. 1. Le Connoiseur in Tokyo, right in the Ginza districe (www.leconnaisseur.jp). I had my first Montecristo Edmundo here and bought a few Cohibas to take back home. Excellent cigar selection, and an excellent lounge where you can have your favorite libations. 2. The Continental at the Okura Hotel (Tsukuba). This is a restaurant right at the top floor of the hotel. The cigar selection is limited, but the service is excellent. They will present the cigar to you in the same manner they present you a bottle of wine when you order it. After you've confirmed your selection, they'll light it up right in front of you with the 3-cedar spill routine. The price of the cigars well…let's just say they were not "value" priced. But, surprisingly, I did find many of the cigars were priced comparatively similar to the prices here in the U.S. In fact, many Montecristos sticks were priced lower than in NY for the non-cuban counterparts. Loved Japan, by the way. I just got back from the JWC cigar bar in Ginza (www.jwc-ginza.com located behind the Tiffany's store on the main strip). They had a great selection of cohiba, davidoff, partagas, ect… along with an awesome selection of Whiskey. The bartender had an Ipad on hand to translate our conversations if he couldn't understand me, I got some awesome truffles, and he used an icepick to hand cut a giant block of ice into a perfect sphere for my glass, awesome!